Don’t let the serious look fool you, he was beyond stoked and so proud. I have always displayed his artwork in various areas throughout the home. I enjoy looking at them as much as he enjoys making them. When we moved to CO, I wanted a way to display his art but also be able to change it out easily. So, one day I saw this picture on a blog that I read, and I posted it to one of my Pinterest boards. Don’t you just love how clean and simple this looks? 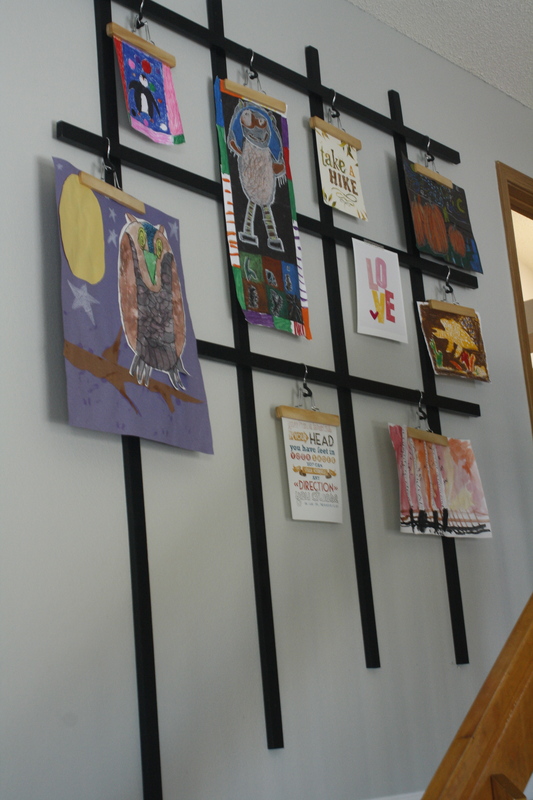 It looked like a great way to hang a lot of different pieces and to interchange it easily. So, the hubs and I got to work. Well, I gave him the idea, and he actually did most of the measuring, cutting, and staining. I did not take pictures of each step in the process. Sorry, that was pre-blog. But basically, we measured the wall going up the staircase to determine the length of the boards we needed. After taking measurements of the boards that would go horizontally and vertically, the hubs cut them. He then laid them out and stained them with a dark stain. 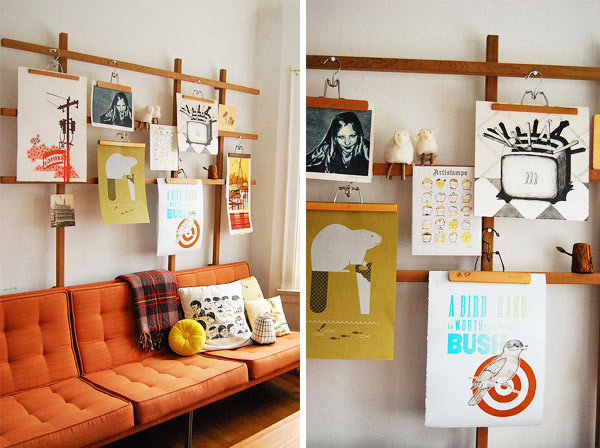 We have a lot of woodwork in our home, so we wanted to contrast the boards for the art wall with the other wood. After several coats of stain and dry time, we brought the pieces indoors and mounted them to the wall. I purchased hangers from the trusty old Target at less than $5 for four and Voila! Here you have it as it looks ToDaY. You will notice his Wild Thing named Hairy is still with us, along with some newer pieces he has created. I have also added some quotes to the art wall. If you are not familiar with Katie Daisy (Take a Hike, as seen above), check her out. I have several of her prints hanging in my home. I love it, N loves it. I plan on changing out the quotes as I find ones that “speak” to me or a member of my little family. So, what do you think? 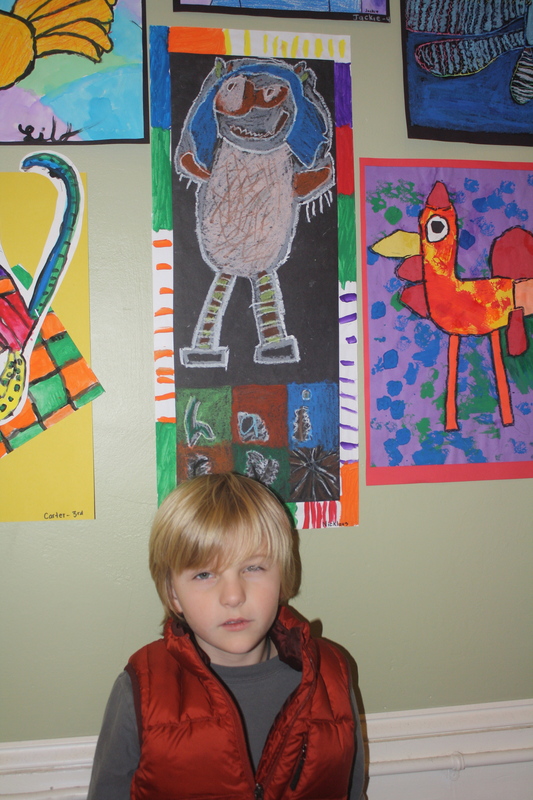 Do you have one area in your home where you display the kiddo’s art? Does your kid enjoy drawing? Does he/she draw anything in particular? Every time I look up at this wall, I just smile because sometimes it is just the little things. Love it! That’s much more impressive than my store bought metal strips and magnets. It’s the thought that counts, right?! Dawn, Thank you very much for the kind comment and for the opportunity. Melanee, I love N’s work!! His Wild Thing named Hairy is fantastic, and I love the owl too. Your way of displaying creations is delightful!!! I would love to put one of N’s pieces in the k’ARTwheels Art Gallery, if he is interested! I would need you to email me a photo, with title, medium and date (optional). Also, what I should list as his name (first and last, or whatever you choose for privacy) and let me know if he wants me to include his age. I believe I have a photo of my daughter standing in front of one of her works with the same EXACT expression on her face 🙂 I can be reached at kdswan@mountainary.com, or through the http://kartwheels.org/ site. Cheers and thanks for writing Melanee! @kartwheels, N will be so excited! I will take a photo and gather the information and send it to you. Thank you very much! Great! I look forward to hearing from you! Melanee, I forgot one thing. If you would like me to link the piece back, please let me know the link. Love the art, and the display! @kwinds, thank you very much. I love that my N loves to create and that the art wall allows for new creations. @allyson, thank you very much. He does enjoy creating and this type of display allows us to change the art easily. @freerangecow, thank you very much. It works very well since N enjoys creating and creating often.